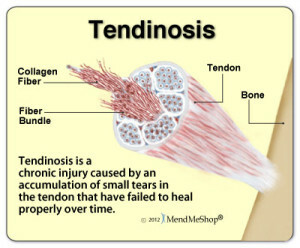 We know that tendonitis is inflammation of a tendon. Tendinosis is a less common diagnosis, but probably more prevalent. Tendonosis is the degeneration of the collagen elements of the tendon. When a patient presents with chronic tendon pain in the Achilles, elbow, shoulder, or hip, it is important to consider the possibility of tendonosis. Karim M. Khan, MD, suggests that many tendinopathies may be tendonosis and the current concept of treating them as inflammatory conditions may be an inappropriate way to look at these problems. He suggests that a tendinosis is often chronic, lasting greater than 6 months. Bonar classified the tendinosis condition as follows: Intratendonous degeneration commonly due to aging, microtrauma, or vascular compromise, collagen disorientation, disorganization, and fiber separation by increased mucoid ground substance, increased prominence of cells and vascular spaces with or without neovascularization, and focal necrosis or calcification. This is contrasted with tendonitis which is described as follows: Symptomatic degeneration of the tendon with vascular disruption, inflammatory repair response, degenerative changes as noted above with superimposed evidence of tear, including fibroblastic and myofibroblastic proliferation, hemorrhage, and organizing granulation tissue. Physical therapy can help the tendonosis patient. Eccentric loading has been shown to clinically relieve the symptoms of tendonosis and assist in return to function. Alfredson H, Pietila T, Jonsson P, et al, demonstrated the value of eccentric loading with Achilles tendonosis and Holmich P, Uhrskou P, Ulnits L, et al, described the beneficial effects of active therapy with chronic hip adductor problems. Similar clinical experiences have been noted with chronic hip abductor tendonopathy. So if you have a patient with chronic tendon pain, physical therapy may be very beneficial.